Daryl Gregory, an author located in State College, attended the Saturday morning author’s breakfast at our 2013 PCTELA conference. If you’ve ever lived in a college town, the first chapter of this book will perfectly capture what you see on a regular basis. The descriptions are spot-on and, quite frankly, hilarious. This long-anticipated novel has a brilliant concept with strong, believable characters and a fast-paced plot. I would say it is one of the best books I’ve read this year. Also, there are many witty metaphors and thought-provoking discussions about free will, religion, and drugs. 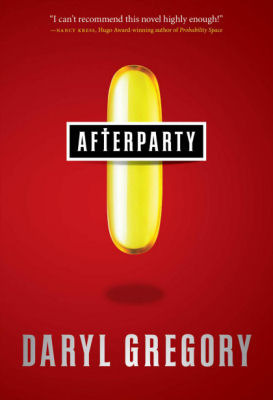 I would say this science-fiction novel set in the near future is not terribly far-fetched. In fact, in the book, Gregory made up an idea of an app to find a homeless shelter, and that app just appeared in real life. One of my favorite characters in this book is the guardian angel Dr. Gloria, who helps Lyda work through her past and her present relationships. But I’m also enamored with Vinnie, who keeps a herd of tiny buffalo in his apartment. The precision of the language and the originality of the plot make this a must-read for everyone. From Goodreads.com: “A coming-of-age tale of fanfiction, family, and first love. Cath is a Simon Snow fan. Okay, the whole world is a Simon Snow fan…. But for Cath, being a fan is her life—and she’s really good at it. She and her twin, Wren, ensconced themselves in the Simon Snow series when they were just kids; it’s what got them through their mother leaving. Reading. Rereading. Hanging out in Simon Snow forums, writing Simon Snow fanfiction, dressing up like the characters for every movie premiere. Cath’s sister has mostly grown away from fandom, but Cath can’t let go. She doesn’t want to.Now that they’re going to college, Wren has told Cath she doesn’t want to be roommates. Cath is on her own, completely outside of her comfort zone. This is one of those page turners that you devour in all one sitting, where you just want to read one more chapter, turn one more page, to find out if everything turns out OK for Cath. 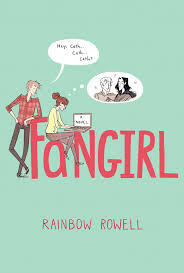 Rainbow Rowell has the gift of creating characters who remind me of my students–witty, clever, vulnerable, strong, human, and ultimately, real. This book reminded me of many of my students who read and write fanfiction. It was lovely to see a respectable tribute to the genre of fanfic/slash fic. If you enjoy this book, try reading Eleanor and Park, another remarkable novel. Rowell even has an adult fiction book, Attachments, which is equally un-put-down-able. Up Late with Veronica Roth’s Divergent! A student of Jennie’s was awesome enough to write this Monday’s review of Divergent. Thanks, Mallory! Tris Prior has waited her whole life for the day she gets to choose her faction, and home, for the rest of her life. But when she takes the test she discovers that she does not easily fit into one of the five factions. She is labeled as Divergent, but must keep it a secret as it is considered an anomaly in her seemingly perfect world. Through her new faction she faces struggles and people that either want to help her of kill her. Along the way she meets Four, a secretive initiation leader that catches Tris’s eye. He helps her see the flaws in the world around her, flaws that force Tris to make a choice far harder than any she’s had to make before. By the end, Tris knows little about who to trust and wonders how one choice could possibly transform her life as much as it does. Action –packed and thrilling, Divergent starts with a fast pace that continues to the very end. The action never stops for even a second and Roth keeps you on your toes the whole time. Tris is a strong female lead and throughout the novel she relies little on others for help. Her character development is immense and she nearly transforms by the end. Four and Tris’s relationship grows and develops and takes a unique turn, as many of her relationships do. There are many surprises along the way that turn the plot down new and unexpected paths. Readers looking for a new type of dystopia will devour Divergent and the rest of the books in the trilogy. Each year, when I teach A Christmas Carol, I tell my students that although many know the story, I doubt any of them have read the original text. For many people, I think this is the case for Dracula as well. Published in 1897, it was by no means the first writings on vampires, which date back to the early 1700’s. Not immediately successfully until the film versions appeared, which then immediately launched the genre. Now regarded as a classic and written in epistolary form, it is a collection of diary, journal, and newspaper entries. As with many novels, it has elements that still could not be presented on film due to content. When fall hits and October approaches, think about getting your hands on a copy and opening it up…you won’t be disappointed. Many have seen the recent Will Smith film, where the antagonists are portrayed more as zombies who only come out a night. Before that, it was a Charlton Heston film, The Omega Man. Before that, it was a Vincent Price film, The Last Man on Earth. Many might not know that before that, it was the 1954 novel, I Am Legend. There is no mistaking the creatures as vampires and our hero, Robert Neville, must try to figure out the “cure”. Vampirism is presented as a disease to be treated and cured, which is unique to the genre. Trust me, if you have only seen the recent film, you don’t know the novel. Set in the 1980’s and translated from its native Sweden, it tells the story of a teenage boy who is the torment of bullies. Soon, a new girl moves into his apartment complex, who doesn’t know what a Rubik’s Cube is yet can solve it immediately, and only comes out a night. 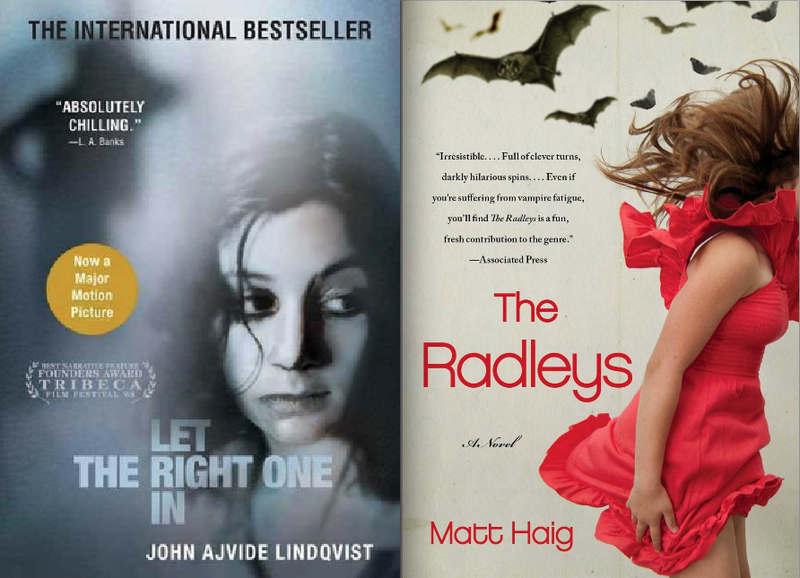 The proper order is to read the book, then watch the Swedish version of the film, then the American remake. All are excellent, and nuanced differently in their mood and tone. I will admit I came to Mr. King later in life (I am now making up for lost time)…if fact, I only read this novel about five years ago. Peter Benchley, in writing Jaws, was intrigued by reports of the 1916 shark attacks off the New Jersey coast. The idea of what would happen if a rogue shark came to a small beach town and didn’t leave. ‘Salem’s Lot is very similar. The idea of what would happen if a vampire bought the biggest house in town, setup “shop”, and didn’t leave. It is a classic ghost story that will terrify you. Bonus read: Find one of the anniversary editions that contains the sequel short story “One For The Road”…completely unsettling and wicked good. Suburban, Modern, Plain English family. Abstaining vampires. Something happens to disrupt their secret and the safety of their children. If vampires did exist and were among us, they would not be the Cullens or those in the Sookie Stackhouse (True Blood) world, they would be The Radleys. Simply a great read. From Goodreads.com: “Ryan Dean West is a fourteen-year-old junior at a boarding school for rich kids. He’s living in Opportunity Hall, the dorm for troublemakers, and rooming with the biggest bully on the rugby team. And he’s madly in love with his best friend Annie, who thinks of him as a little boy. I took my class to the school library to choose books, and our librarian hands me this book and says, I bet you can’t get through the first three pages without laughing out loud. I took the book skeptically, but he was dead on: I laughed aloud within two. Ryan’s voice is wry, compelling, and at times, heartbreaking. After I read this (staying up way too late when I should have been sleeping–or grading) I went and bought three more copies for my classroom. I have a few rugby players in class and they argued over who got to read it first, so I had to make sure I had some spares. My non-rugby players also enjoyed the read. This was a perfect book for many of my tenth graders, but because of the prolific f-bombs, may not be great for some students who are not ready for explicit language. The storyline also has mature themes: I cried like a baby at the ending and was utterly devastated to learn of the heartbreaking trauma Ryan experienced. I think one of the reasons I loved this book so much was the sensitivity Ryan exhibited–here’s a young man with feelings and friendships and frustrations. He also happens to be a rugby player at a private school who is trying to navigate being a friend, being a teenager, being a son, and being a (potential) boyfriend. All of the minor characters seemed fleshed out and real as well. I also just discovered there will be a second book in this series, which will come out in January 2015, where we will see Ryan in his senior year. I know I’ll be sure to check that book out before my librarian has to recommend it to me. Best friends and seventh graders Sophie Young and Grace Yang have made a game out of spying on their neighbors. On one of their midnight stakeouts, they witness a terrifying, bloody scene at the home of their bizarre middle-school counselor, Dr. Charlotte Agford (aka Dr. Awkward). At least, they think they do. The truth is that Dr. Agford was only making her famous pickled beets! But when Dr. Agford begins acting even weirder than usual, Sophie and Grace become convinced that she’s hiding something—and they’re determined to find out what it is. First, let me say that Kristen has written an awesome debut middle-grade novel. I am super excited that this is the first in a series of Young and Yang mystery novels. Growing up, my grandmother had the entire Nancy Drew mystery series…and guess what? I devoured every single one of them. Although I had read a number of other MG mysteries since, none gave me the feeling I had when reading Nancy Drew (twists, turns, super-suspense!) UNTIL I read The Wig in the Window. There is just so much to love about this book! Kittscher has created two well-developed, quirky characters that I want to learn more about. 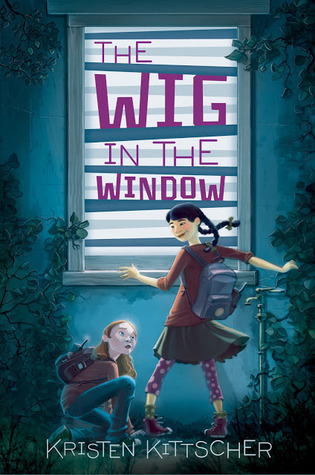 Both young sleuths struggle through typical middle-school drama (friendship issues, annoying parents, crazy teachers), that all young readers can identify with. The dialogue between the two friends rings true and is absolutely hilarious. I actually found myself lol-ing at times! This story of friendship and courage is one that readers of all ages will enjoy. Definitely check this one out! P.S. I love the cleverly titled chapters…(Wigging Out, Stranger Danger, Amazing Grace, etc. ).